← What Is the Cost of Brain Waste for Highly Skilled Immigrants in the U.S.? The recent changing of the guard in both US and Philippine politics threw a dark cloud of doubt over my head. It made me question if my diaspora giving could continue to make a difference in this world of increasing cynicism, fear and xenophobia. Are donations from the diaspora now be considered suspect and have a hidden agenda other than altruistic motives? Aren’t those immigrants all “terrorists”, “rapists” and “criminals” anyway? (Trump Doubles Down Calling Mexicans Rapists, CNN News, June 2015). 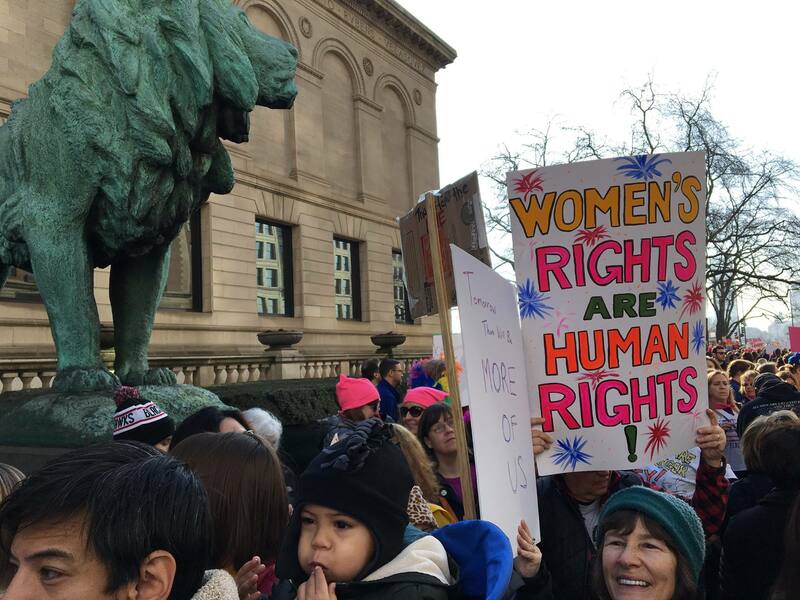 On January 21, 2017, I joined hundreds of thousands of people in Chicago’s Women’s March for women’s rights. At that march, I was surprised to be greeted by rays of hope that encouraged me to continue my diaspora giving. That ray of hope came through a song. I was standing next to a woman in the march and she asked me to help her sing the song “This Land is Your Land.” I said yes. We started singing and all of the sudden, hundreds of people around me were singing the refrain: “…this land was made for you and me.” It was magical. I didn’t even know all the words to the song “This Land is Your Land” but hundreds of marchers helped me sing the song. This land was made for you and me – indeed. The march did not expect the hundreds of thousands of people who clogged Chicago’s downtown streets. Then a woman passed by carrying the sign: “The United States of immigrants, citizens, veterans, Muslims, Christians, Atheists, Jews, Asians, natives, whites, blacks, Latinos, Boomers, Gen X, millennials, disabled, poor, middle class, LGBTQ.” In my many years organizing for the Coalition of African, Arab, Asian, European and Latino Immigrants of Illinois (CAAAELII), I have never seen such a hand-made sign being carried by a white, middle class woman. The world is changing for the better. I suddenly have hope. As we marched further down through downtown Chicago, people started chanting: “Immigrants are welcome here, no hate, no fear”. I started to cry. I reflected back on my years working for immigrant rights. 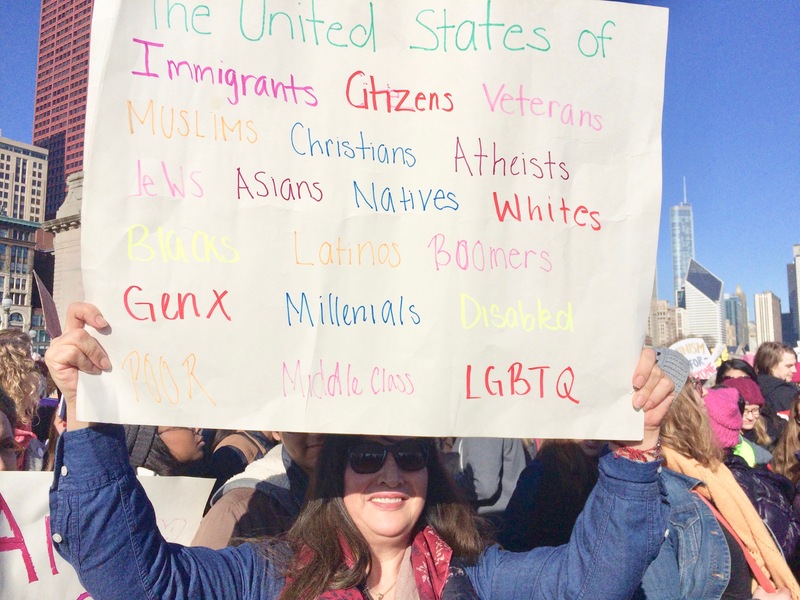 I have never thought I’d see the day when a sea of strangers – white, black, Latinx, young, old, LGBTQ, Muslim, Jews, Christians, atheists, would all be chanting spontaneously, “Immigrants are welcome here.” I am welcomed here. For a moment, the hateful rhetoric of current politics seem to fade away. For a moment, I belong. I was hopeful. In the end, I left the march feeling more resolved to continue my giving, locally and globally, and to continue to make a difference – one act of giving at a time. 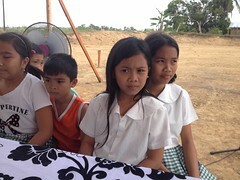 This entry was posted in Chicago, Diaspora Giving, philanthropy, Philippines, Uncategorized and tagged Diaspora Donors, diaspora giving, philanthropy, Philippine giving. Bookmark the permalink. Great post! Thanks for taking the long view of the situation.